Return air vents are an important part of your HVAC system. These vents allow the air that is in your home to return to the system for heating or cooling in order to maintain the proper temperature in the home. In addition, the air that is returned to the system will be filtered, lowering the amount of dust and dander that collects in the home and during a humid day in the summer, excess moisture will be removed before the air is returned to the home. A fan or blower inside the HVAC system draws air into the cold air return or return air vent. After entering the vent, it works its way through a filter before it enters the heat exchanger or the cooling coils. With heat pumps and air conditioning systems, this is of vital importance as the space between the fins on the coils is very small and dust from unfiltered air can quickly reduce the airflow through the coils and reduce efficiency. The bottom line is that without the filtration, you will eventually pay more to heat or cool your home. When the system is working in the heat mode, the air from the return air vents is heated. In heat pumps, this means the air passes through the air conditioning coils that are working in reverse and are with warmed refrigerant. In other systems, the air may pass through a chamber warmed through the combustion of natural gas, propane or heating oil. Older resistance heating units may use electrical heating elements to heat the chamber and in turn the air. Once warmed, the air returns to the house through a series of ducts and air vents. Return air vents are generally located near the center of the homes. Older and newer homes often have one register per floor, but homes built from 1960-1990 may have a cold return air vent in each room. The high capacity and high efficiency furnaces allow the contractor to install fewer returns and still maintain efficient air return. Return air vents require very little maintenance. The suction that causes the air to pass through the system may also pick up dust and draw it into the system. Most of the time this dust simply passes on through the system and a filter traps it. Over time, dust may begin to collect on the grate of the vent. Remove the dust by simply dusting on a regular basis. Leaving the dust in place can allow moisture to collect on the vent and cause rust. 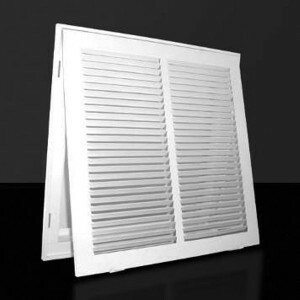 If the return air vents in your home are no longer aesthetically pleasing, you might want to replace them with a new vent cover. Covers are very affordable and can do a lot to improve the looks of a room. Next post: Wall caps are useful for rooms needing ventilation.